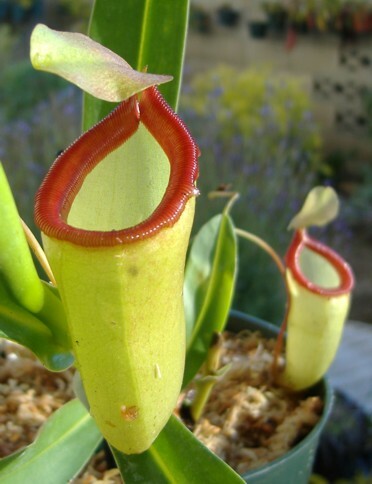 Nepenthes ventricosa X inermis is a hybrid between two highlanders. 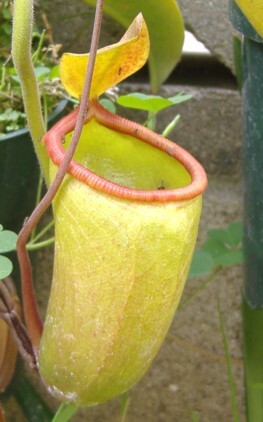 This particular plant has been available at times from Borneo Exotics from cuttings. As of late 2006, small cuttings became available. I bought two of those and one larger plant from Tony at Exotic Plants Plus. I grow them as highlanders outdoors without any problems. I don't know if Borneo Exotics only has the one clone and thus all cuttings will be exactly the same. Borneo Exotics at this time seems to release mainly naturally occurring hybrids and not horticultural hybrids like Exotica Plants does. I hope I'm correct that this hybrid isn't naturally occurring. The peristome is very red while the rest of the pitcher is green. At this time, I don't know if this is an upper pitcher or lower pitcher. It may be possible that there's no difference between the pitchers at all.